WBA #6, IBF #5, WBC #5 Undefeated Australian boxing sensation Andrew “The Monster” Moloney 16 (10 KOs) – 0 returns to the ring for his second outing of 2018. 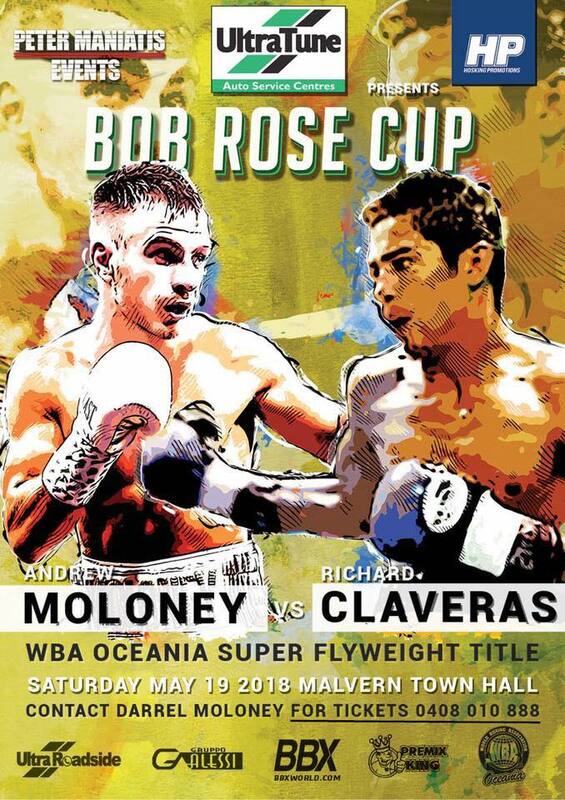 Moloney defends his World Boxing Association Oceania Super Flyweight title for the 3rd time in as many fights against Richard Claveras 18(15 KOs) – 3 (1 KOs) -2. The fight will be at Malvern Town Hall in Melbourne Australia on the 19thof May. “It’s an honour for me to represent the WBA. They have shown great support of me so I will continue to show my appreciation and continue defending their title”. This will be Moloneys 8th WBA regional fight and is sitting at number 6 in the World ratings and is knocking on the door for the coveted WBA World Super Flyweight Championship against Englishman Kal Yafai. “This is the fight I want. I have watched a lot of Yafai’s fights and I truly believe I can beat him and achieve my dream of becoming World Champion. All I see is me winning the fight and having that World Title belt around my waist. Yafai is a good fighter, he is a world champion for a reason but I believe I have what it takes to beat him”. Moloney will need to get past Claveras first. With an 83% Knock out ratio from his 18 Victories, the man known as “Explosive” states he will not leave it to the judges hands. Claveras is no stranger to traveling either, June 13th last year Claveras lost a controversial split decision for the coveted OPBF Championship to Keisuke Nakayama at the World famous Korakeun Hall in Japan. Most ringside believe the Filipino did enough to get his hand raised. In November 2015 he also fought for the WBC World Light Flyweight Title against Mexicos Pedro “Pedrin” Guevara. The pedigree of Claveras cannot be questioned and Moloney will need to be at the top of his game. “I have watched a few of Claveras fights now. I can see that he is a strong fighter and know that he is going to come here to fight. He has a come forward style and let’s his hands go, so I’m sure the fans will be in for a real treat on May 19. Claveras has 15 ko’s out of his 18 wins so I would say his power would be his biggest strength. I am going to have to be switched on at all times during this fight and avoid getting hit as this guy obviously has knockout power. May 19th – a Blockbuster Twin Bill featuring Australias biggest prospect Andrew and Jason Moloney.